The Obama administration has been doing a pretty poor job hiding their desperation when it comes to convincing the young people that they need to subsidize the entire system that they should sign up for insurance through ObamaCare — because without getting them to pay more money into the system than they’ll actually need to use, that whole “affordable” thing is going to fall apart pretty quickly. Total numbers that include both insured and uninsured aren’t nearly as useful as breakdowns that separate these two groups. And these numbers are much less encouraging. 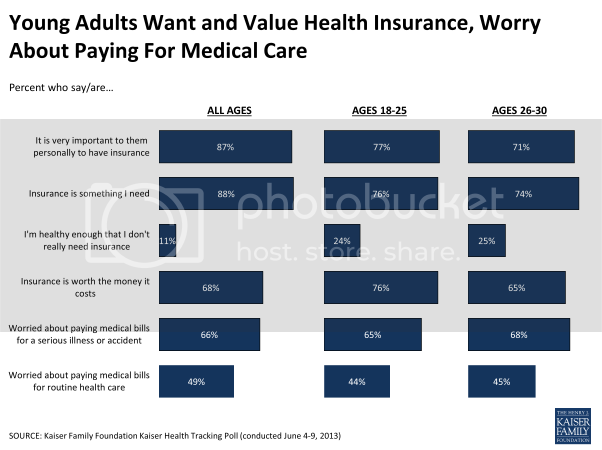 True, 76 percent of all insured ages 18-64 say that “insurance is something I need.” But 40 percent don’t think health care is worth its price, and that number should be extremely troubling to ACA advocates. Since many of the currently insured will keep their current employer-based plan, the fate of the exchanges really hangs on the decisions of the uninsured. Unless a high percentage of currently uninsured youth opt in, Obamacare will face severe, possibly fatal, problems. Media outlets lately have emphasized the challenge of enticing healthy young adults to sign up for ObamaCare, “exactly the type of person insurance plans, states and the federal government are counting on to make health reform work,” as the L.A. Times put it. These pieces are useful as far as they go, but miss a key point that Supreme Court Justice Samuel Alito managed to convey in many fewer words during last year’s Supreme Court argument on ObamaCare. Since he puts it that way, why would they sign up for ObamaCare, especially since the alleged penalties will be negligible and likely unenforced?